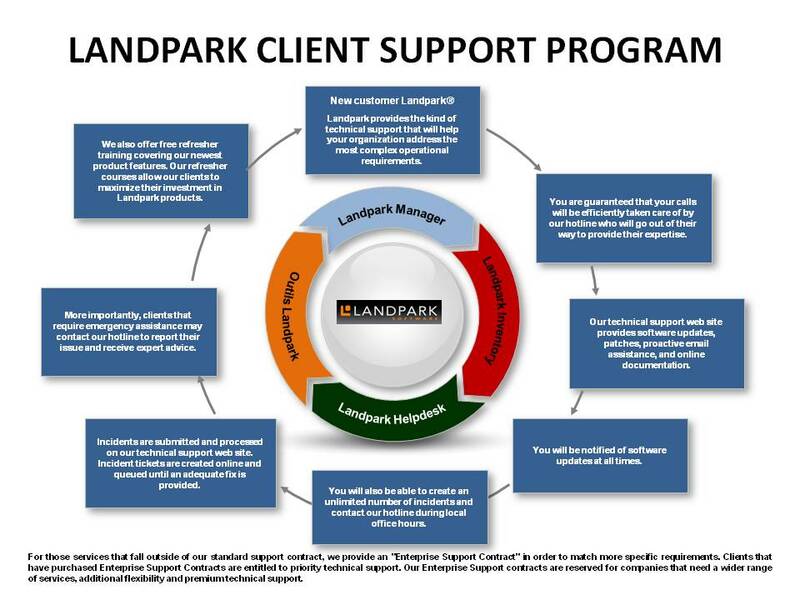 Landpark provides the kind of technical support that will help your organization address the most complex operational requirements. Active support for improved client assistance. 1/ Our standard maintenance contract. We also offer free refresher training covering our newest product features. Our refresher courses allow our clients to maximize their investment in Landpark products. 2/ Our "Special Enterprise" maintenance contract. For those services that fall outside of our standard support contract, we provide an "Special Enterprise" contract in order to match more specific requirements. Clients that have purchased Special Enterprise contract are entitled to priority technical support. Any requests regarding database inconsistencies, configuration or locale settings. Our Enterprise Support contracts are renewable annually, and reserved for companies that need a wider range of services, additional flexibility and premium technical.